Women Riders Speak is an interview series about women and motorcycles. Through their stories, women illustrate the transformative role motorcycling has played in their life. In this interview, read about Julie Dorie’s beginner “joy ride” and how she overcame the fear it caused. My very first ride on the back of a bike was twenty-seven years ago and was not at all enjoyable. Seven years later, curiosity got the better of me and I decided to get on another bike. After that ride, I was hooked! I always thought the only way I would ever get to ride, was on the back of a bike. I always wondered what it would be like to look at the open road in front of me, instead of the back of someone’s helmet. I can be competitive when I want to be, so not to be out-done or left behind, I told my husband that when he got his licence, I was going to get mine as well. 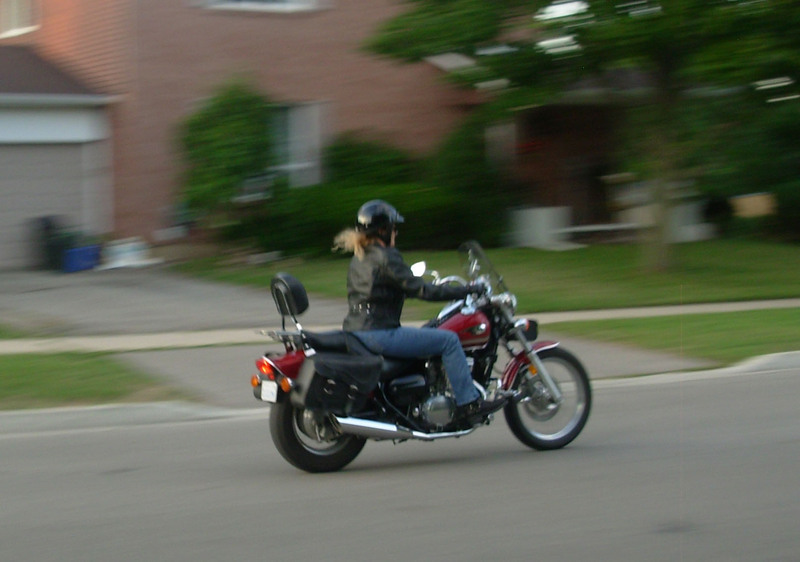 The day after I passed my M1 (written learner’s permit) and my husband wanted to teach me the friction zone before I took the Humber College (Basic Rider) course. Big mistake! Fortunately, I had insisted the cars and the kids were off the driveway. With the engine running, he told me to let the clutch lever out slowly. Well, didn’t that clutch lever fly out of my reach! The bike began to move and because I panicked, I rolled on the throttle and shot out of the garage like a rocket, down the driveway straight for my car that was parked on the other side of the street. To avoid it, I turned the bike towards my neighbor’s driveway, but ended up popping the curb instead and now had direct aim at her living room window. I remembered the kill switch and laid the bike down on the lawn, jumping off just as it was going down. I seriously considered giving up. When I talked to different friends who ride, they all told me that I could do this. I decided that only way to conquer this new fear of a bike getting away from me, was to get right back on. I enrolled in the course but because I couldn’t shake my new fear, I didn’t pass the test the first time. I passed with an almost a perfect score on my second try! With two young children at home, I am not able to be gone for long periods of time, which means no more than a couple of hours. However, I have managed to put just under 3,000 kilometers in two months of riding. When my kids are older, I would love to ride down the Pacific Coast Highway from Washington to California. Women tend to over-think everything, while men just go do it. When I see another woman on a bike, I am in awe of their confidence and empowerment. There is a bond between women riders, a “sister-hood” that is hard to explain. Women riders are not out to impress anyone but themselves. My greatest joy from riding is the moment I leave the city and get into the countryside. An overwhelming sense of calm comes over me. I love the smell of the countryside; the changes in temperature and the breathtaking views. These are sensations that you just cannot have while sitting in a car. People call riding a “bug”, but it is more than that, It gets into your blood. I am still a beginner and every time I get ready to go out, I have to get my heart out of my throat and tell my stomach to stop doing back flips! With each mistake I make I use it as a lesson learned, from not shifting correctly to applying too much of the front brake. All of these will make me a stronger rider. My fear of losing control of the bike, sometimes gets the better of me so whenever those thoughts come into my head, I have to push them out. I know with each ride, I will become that much better and not doubt myself or my instincts. I am so happy that I pushed myself to do this, even after I failed the first time. Good for you for sticking with riding. It hard to get back on when you have had a spill. I love the quote in ‘Women, Motorcycles and the Road to Empowerment’ about not enough room on the bike for you and fear. I’ve been there so many times myself. Happying riding. So often we think “special moments” happen only to us and we let them control us. Kudos to both of you for parking your fears and moving past them! Ila will be pleased to hear that you’ve quoted her!